Cuban rum, specifically the drop emanating from a bottle of Havana Club 7, is one of those drinks I can back down with unearning ease. Something that tastes this good seems to disappear faster and faster the more I drink it, and when it’s matched to the yellow and pink glaze from the sunset streaming across the Malecon, itself a near straight shot from Tampa, it’s almost difficult not to enjoy life. In the background, the hustle and noise of Cuban life carries on unabated. An old man with a nondescript two-stroke crackles by, followed a stunningly clean Chevy Bel Air two-door in baby blue carrying cashed-up tourists. The two sides of Havana: classic American iron and cheap Chinese motorcycles. This is the final night of our six-day adventure into the depths of the Cuban dream. I’ve wanted to visit this most mysterious of lands since 2001, when the physiotherapist treating me for a work accident had just returned from her third trip to Havana—quite the journey from Sydney. Her sheer obsession with the place was enough to infect me with a want to see Cuba first hand, so the wife and I pulled the pin last August and booked the tickets. I’ve never been to a communist country before. I’ve read about places like China and Vietnam, but never seen the day-to-day lives of a regime such as those of the Castros up close. 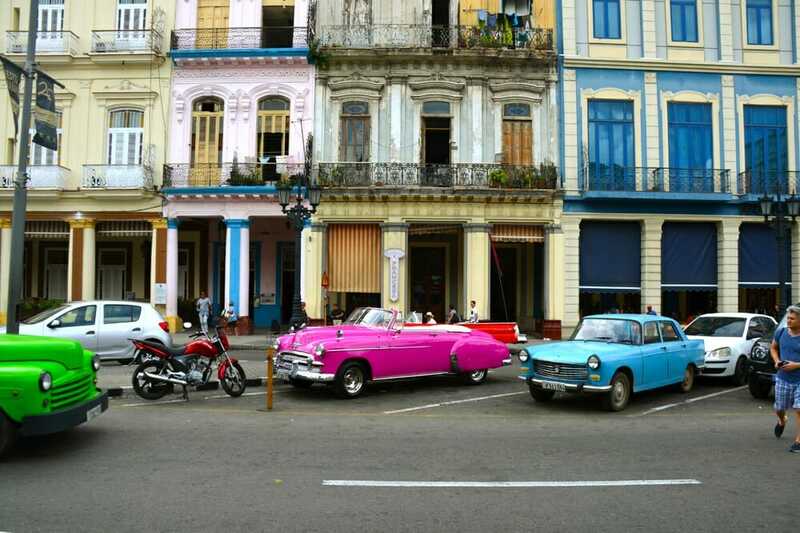 The old theory of Cuba, and particularly Havana, is it is stuck in 1950s. And while that’s got an air of truth to it, the real age is some imaginary era between 1950 and 2007, about the time when mobile roaming data became a real thing for almost everyone else in the world. The motorcycles around Havana tell part of the story. Unlike the grand American cars that dot the roads and provide a large chuck of the projected Cuban image tourists love, the motorcycles are a throwback to what you’d expect a land removed of western influence and goods to have. Long gone East German marque MZ with their ETZ250 features heavily in Havana. This is the brand that powered people around eastern bloc countries during the reign of the Soviet Union, so to see its little two-stroke, the first MZ to be fitted with a disc front brake and oil injection, is no great surprise. These little smokers are strong as an ox and give a tinny soundtrack to the atmosphere thanks to the straight-shot exhaust pipe that’s got a hint of Walter Kaaden genius to it. Havana, indeed greater Cuba, has been left in the proverbial Stone Age for motorcycles. The fall of the Soviet Union meant an end to the import of almost any motorcycle to come from Europe to the Caribbean island, although the odd Jawa and numerous Russian two-stroke sidecars can be found cruising the streets. You can also find the occasional Suzuki GN250 parallel-twin four-stroke, and, if you’re really lucky, a Yamaha Virago. You can also rent a vintage (pre-1960) Harley-Davidsons from any number of tour companies in Havana, but in the week I am there I don’t see a single big twin from Milwaukee. The European, Japanese and Russian bikes might be from multiple generations ago, but there’s one country taking up the slack. Predictably so, this is fellow communist country, China, who has flooded the Cuban streets with ultra-cheap electric scooters under the Mishozuki label. The tagline for Mishozuki is “Made For Japan,” but these scooters lack the, err, quality, one would expect from China’s neighbors to the east. A quick search on Alibaba has the Mishozuki going for between $599-$999 (so long as you buy nine or more), so you can’t argue about the price for a country whose population has a tragically low average income of around $25 U.S. per month. That’s why the Cuban people must make do with what they have, and in Havana there’re several back-alley machine shops using, again, extremely old metal working tools and machines to keep these bikes on the road. There’s an art to the tradesman’s work as they manufacture and refurbish parts with consummate ease, but it’s hard not to feel like the citizens of Cuba are being given the raw end of the deal when the police are riding bikes like CFMoto 650MT and the ambulances are Mercedes Sprinter vans. This feeling gets reinforced when I chat to a young Cuban at a bar late one night on the Malecon. In near perfect English, he tells me he’s sick of not just old bikes and cars, but of the simple things, like not being able to have easily accessible internet, and how the beautiful Spanish-style buildings in his home city seem to be falling down around him because no money is put into their maintenance. “We want what you have,” he tells me emphatically. It’s hard to argue with him. There’s a definite charm to doing your own little time travel as a tourist, but I also like my new motorcycles, my (somewhat) current model car and being able to chat to my kid on facetime while I’m traveling for work. This being the case, the resilience of the Cubans I meet during my stay makes me feel a bit of a wimp. Not being able to just purchase new stuff makes them have to think and create on their feet, and I can imagine the undoubted Cuban flair for design would make this place a hot bed of custom motorcycle culture if newer and different bikes ever get there. On my final night, staring at the Gulf of Mexico smashing into the walls of the Malecon with rum in hand, I’m left feeling a little perplexed about my time in Cuba. The people are some of the most lovely and friendly I’ve met on tour anywhere in the world, the food gets about a three out of 10 at best and the cars are cool remnants of a time the west forgot several generations ago. Yet in an increasingly connected world, Cuba is in the dark ages, and I wonder how much longer that can last for its people. I can only image how the bike culture would explode with greater access to ideas and influence from outside its borders, because this is a country perfectly designed for riding.